Ok, to all new drivers and those that are considering becoming a truck driver, I'm gonna spill the beans here and now. It will be embarrassing for me, but I don't mind embarrassing myself and eating some humble pie if it can help new drivers even in the slightest degree. 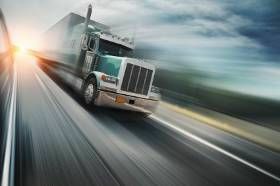 Ever since I started researching becoming a truck driver, I have been to many websites, talked to many drivers and heard good and bad about not only driving, but just about every company you can drive for. I have been driving solo for almost 8 months. I have never been late for a load, I have a great relationship with my dispatcher , and I never complain. I take what they give me and run with it. If there is one thing that TruckingTruth has taught me, it is that keeping a good attitude no matter what the situation can make all the difference in the world, and I think in my case, it was the biggest difference!! I had been out on the road for 4 1/2 weeks and was due my home time in another 4 days. Because freight was slow in my area, my dispatcher put me on a dedicated route close to home to ensure he could get me there on time. Things were going smooth. I delivered 2 different loads the first day, then was dispatched to another dedicated run about 40 miles away to finish out my time. I received the load and headed out, delivered the 3 drops and came back. I had one more day of work left, so they set me up with a 2-stop drop the next day and had me going home after that. I left the next morning for my deliveries. I got to the first drop, unloaded the truck (these are driver unload stops) and headed for the second. When I arrived at the second drop, I immediately knew that something was wrong. It was 0530 in the morning and the shopping center was completely dark. No lights, no cars, and the windows were all boarded up! I double checked my directions and the address to make sure I was in the right spot, and sure enough I was. For giggles I drove to the back to see if there were loading docks, as I am driving back there, I see the back of the building is being held up by big support beams. This building is obviously not occupied. As I get ready to pull out my phone to make a phone call, I see headlights turn on in front of me and then see blue lights from a cop car. The cop was obviously taking a nap behind the building when I disturbed him, LOL. I walked up and asked him if this store had moved. He said it had and gave me directions to the new location, only about a mile down the road, I thanked him and went on my way. As I am approaching the new location, I see the sign for the building and also notice that it is in the middle of a strip mall. Rational thinking tells me that the loading docks are behind the strip mall, so I hit the access road and enter the parking lot to the rear of the building. It was raining pretty hard, and the back lot was not lit up, so it was really dark. I am driving thru the back lot, looking for the loading docks to the store, when I should have been looking in front of me! I look up for a split second, but by then it was to late - by the time I hit the brakes, I had already hit the light pole, smack, head on with the front of my truck. It all happened in slow motion. My truck bounced off of it, and the pole fell right in the parking lot. My heart sank. I could not believe what had just happened. I took my eyes off the parking lot in front of me for two seconds to look to the left for a loading dock, but that was all it took. I immediately called dispatch, safety and maintenance. After some back and forth phone calls and some explaining, they had put a plan in action. They had a driver not far away, and he was an experienced driver who was going to come help me out. Since my truck was done and couldn't move, he was gonna have to grab my trailer, deliver the load, and then come back and pick me up while maintenance sent someone out to recover my truck. The driver showed up, and after evaluating the situation, hooked a cable to my truck to pull it out from under the trailer. He hooked up, told me to gather my things and he would be back to get me when he was done with the load. It was raining, I was soaking wet, and most of all, I was completely mad at myself for this stupid, stupid accident. About an hour later, the driver came back, he helped me load my stuff up into his truck, and off we went back to the OC. It was about 200 miles back. It was a long drive, but the driver, who had been with the company for over nine years, made it easier on me. He talked to me about the accident, gave me some advice, and told me he would make sure I got back. I don't want to mention his name, but I am thankful to him for all the help he gave me. It really made a big difference. When I got back to the OC, I went inside to talk to my dispatcher. He sent me to get a drug test (standard procedure) and when I got back, he told me to go home for my home time, and to call him first thing Monday morning. Now, being kinda new, I didn't really know what to expect. I wasn't even sure if I still had a job, but I was keeping a good attitude. I went home and tried to relax for the weekend. On Monday I called my dispatcher and he told me he still did not have a truck for me, to call him the next day. I called the next day and he said he was still working on it, to call back tomorrow. I was starting getting nervous, unsure of whether they wanted to find me a new truck. Out of the blue, my dispatcher calls me that afternoon and tells me he has a truck, to be at the OC the next morning at 0700 to meet with safety. I was somewhat relieved. The next morning I met with safety. The safety officer and myself sat down and had a talk about what happened. I didn't make excuses, I told him straight up what happened. He talked to me for a bit, then had me watch a video and had me do a training class online. After those were done, we sat down and talked again - he was very positive and told me he liked what he had heard from me. He talked to me about things I can do to avoid this in the future, then he released me to my dispatcher. Needless to say, I still have a job, and am back out on the road delivering loads. I have heard stories and read stories on other sites about drivers bumping their truck into a pole and getting fired, and I was always a bit skeptical and secretly questioned whether they were telling the whole story. I completely destroyed the front of my truck, it had to be towed, and probably cost the company a lot of money, but I still have a job. I like to think the reason I do is because of my attitude. I keep my attitude positive, I don't complain, and I do what the company asks me to do because after all, they are my employer! So, let this be a lesson to every new driver and those considering becoming a truck driver. IGNORE the "BFI" comments and the things you may read about some of these trucking companies. After reading my embarrassing story, you should come to at least one conclusion - most of the things you read just simply aren't true. I believe if you keep a good attitude and do your best for the company like I have, they will see that and treat you equally as well as they have with me. The company I drive for is considered by many to be a "BFI" company, but I have found them to be completely the opposite. If I had a bad attitude, didn't deliver loads on time, and preferred hanging out in truck stops instead of driving, I am 100% certain that I would be looking for a new company to drive for today. Hopefully this wasn't too long that it lost your attention, and I hope all of you reading it can learn something from it. Until the next blog, BE SAFE!